Breathe Arts Health Research CIC is a social enterprise that works with a range of health organisations to design innovative ways of using arts and creativity in healthcare to improve patients’ health outcomes and experience of care. Through its tenancy at the Clarence Centre for Enterprise and Innovation, Breathe and London South Bank University (LSBU) have collaborated to benefit both the social enterprise and the University’s students. The social enterprise delivers the Breathe Magic Intensive Therapy Programme, an innovative occupational therapy (OT) programme for young people with hemiplegia, a paralysis or weakness on one side of the body caused by a brain injury. 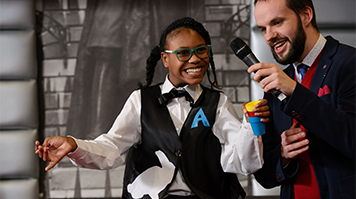 Designed in collaboration with occupational therapists and professional magicians, the evidence-based OT programme incorporates learning magic tricks into young people’s one-to-one intensive therapy, which is delivered within a group setting. OT students at LSBU get two opportunities to work with Breathe, either through undertaking a six week practical placement as a part of their studies, or by volunteering to work as ‘Magic Trainers’ over the holidays. Students benefit from gaining hands on paediatric experience and being exposed to innovative ways of delivering occupational therapy. “I cannot emphasise how welcoming and supportive the team are, whilst delegating reasonable challenges to push you – perfect for students who often learn best in this kind of environment,” said Joanna Cox, BSc (Hons) Occupational Therapy graduate and Volunteer Magic Trainer. All students who participated were supervised by a Clinical Lead at Breathe and received preliminary training to improve their understanding of paediatric hemiplegia and the programme’s unique approach before working on the programme. “Our students have really benefited from their placements. It is a truly inspiring environment where OTs are able to demonstrate the unique value of their profession to students and facilitate life changing improvements for children with neurological conditions,” said Ian Merrick, Senior Lecturer and BSc Programme Practice Placements Facilitator in Occupational Therapy at LSBU. “We are always looking for ways to support local workforce development and are very glad to be able to provide paediatric-focussed work experience and clinical placement opportunities for LSBU Occupational Therapy students on our Breathe Magic Intensive Therapy Programme,” said Yvonne Farquharson, Managing Director at Breathe. Breathe Arts Health Research’s relationship with LSBU extends beyond these placements. LSBU’s student-led OT Society has raised funds for the social enterprise and provides student volunteers for its one-day skills club events. Breathe staff also speak to students at the society’s training and networking events, offering professional guidance and advice. The organisation also worked with LSBU to provide a three month internship for a BA (Hons) Housing Studies student.